Just a day before the Perth Test, the Indian team got a major setback with two of its key players suffering injuries that would rule them out of the second Test, at the very least. 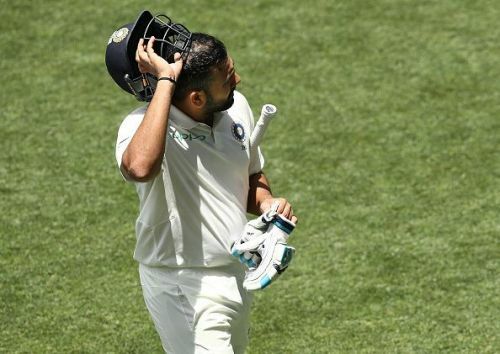 Both Rohit Sharma and Ravichandran Ashwin are undoubtedly two key players for India and there is a good chance that both would have been a part of the playing eleven for the Perth Test. However, one could argue with all due respect to the exceptional abilities of the concerned players that their absence is going to have little impact on India’s chance. In fact, at the risk of sounding controversial and even blasphemous, one could even make a case that the injuries to the two players could actually be a blessing in disguise for team India. This is for the following reasons. If Rohit had been fit, he would have been a certainty in India’s playing eleven at Perth given Kohli’s trust in his ability and the success of a four-bowler strategy at Adelaide. However, with Rohit out of the Test, Hanuma Vihari is a like-for-like replacement at number six slot. It is futile to compare the abilities of Rohit and Vihari in the Test format. Though Rohit is a far superior batsman in the limited over formats, it is safe to say that when it comes to Test match cricket, there is not much difference between what each of them brings to the table when it comes to batting at number six. However, the added factor that Vihari brings is his ability to bowl some tidy spin. This is especially important for a Perth pitch that is not going to be spin-friendly and would assist pace. Hence, the role of a spinner is mostly to give some respite to the seamers, and wasting a bowling spot with a front-line spinner would not be wise. If Ashwin was fit, India would have seriously considered having him in the team, despite the green tinge on the pitch. But with him out, there is a great probability of Kohli having four pacers in the team. Just like the Johannesburg Test earlier this year, this could yield the desired result for team India. So, the injuries to Rohit and Ashwin may actually work in India’s favour in the Perth Test.